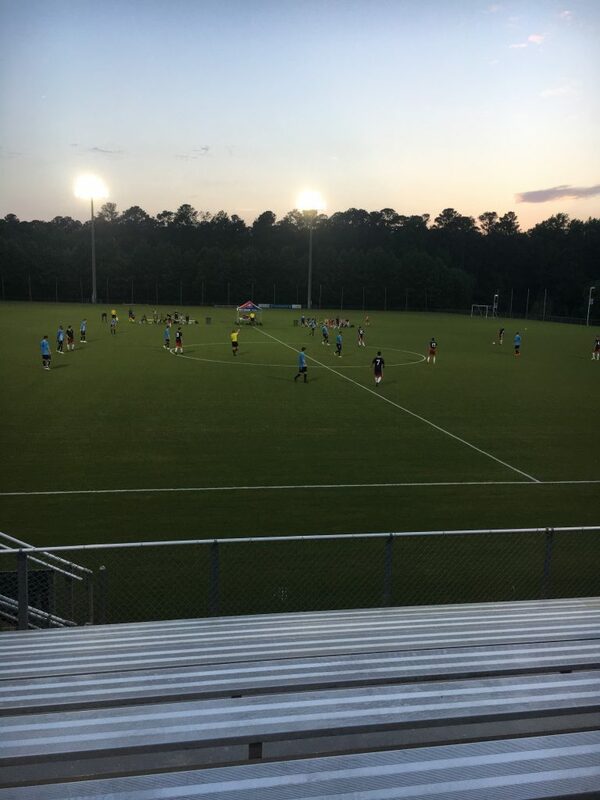 After their 2-2 draw in the first match of the season, North Carolina FC u-23s defeated the Wilmington Hammerheads 3-1. The play was better from the home side on the evening, the passes were crisper, and the overall play was faster. The Hammerheads had a decent amount of possession also, playing it side-to-side to find an opening towards goal. It was evenly played throughout the half, but the u-23s got on the scoreboard first. Forward Dean Rutherford chased down a loose ball, there was a miscommunication between Hammerheads defender Matt Morgan and goalkeeper Drew Romig, Rutherford was able to get between them and Morgan wrestled the forward to the ground to give up the penalty. Winger Josh Coan converted the spot-kick to give NCFC a 1-0 lead heading to the break. The Hammerheads tried to find the equalizer as they pushed more numbers forward in the second half, but NCFC scored their second after some powerful individual play by substitute forward Damieon Thomas. He was able to muscle Matt Morgan off the ball and squeezed his shot into the net from a tight angle. A minute later, Wilmington got on the board through a set piece that caught everyone off guard, David Lozano found himself alone with the keeper, struck a powerful shot on goal to give the away side a glimmer of hope with six minutes remaining. 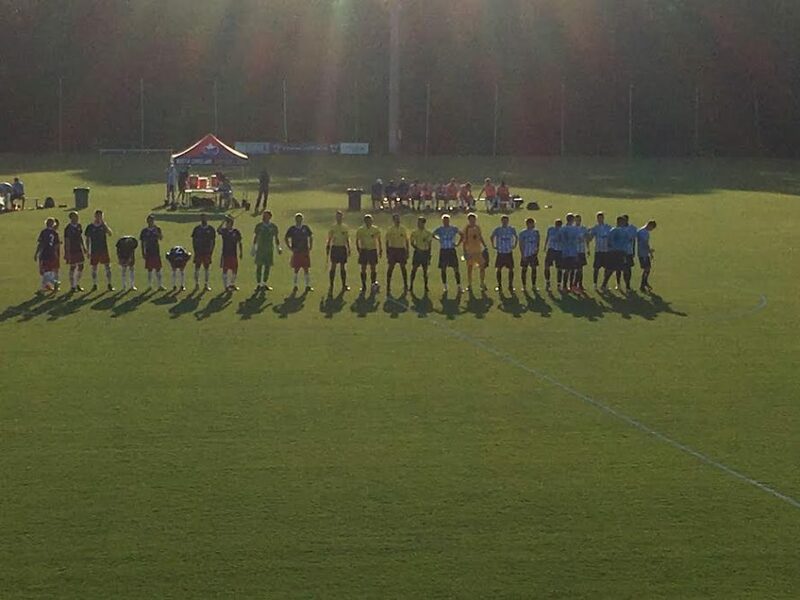 That hope was dashed when two NCFC substitutes combined for the third, Cameron Steele found Arty Kouzine streaming towards middle of Wilmington’s defense, the forward calmly beat multiple defenders before squeezing it past Romig to guarantee a valuable three points in this early PDL season. Jamil Gracia (UNC Wilmington, Rising Sophomore, Right & Center Back): Very strong 1v1 defender. Made several goal-saving tackles. He is still a bit indecisive when carrying the ball up the pitch. Jamil can still improve on his passing but the potential is there. When he takes two touches, his touches are clean. When he takes more than two and tries to dribble out of pressure, he finds it more difficult. Looked more comfortable as a right back than in the center. If he can continue to improve, he can be a pro. Vinnie Durand (NC State, Rising Junior, Goalkeeper): I found myself intrigued with the transfer from James Madison University. In these two matches, he made some weird mistakes. Catching wasn’t as clean, his punts left a lot to be desired, but he made several decent saves and he has good frame to command his area. Durand just needs to be more consistent with his play. I am sure George Kiefer and his staff will get him up to speed or it might be another long season for the Wolfpack. Dean Rutherford (Charlotte, RS-Junior, Forward): Scrappy forward who was a nuisance for the Hammerheads all evening. Caused the penalty with his endless running and continued to cause issues throughout the match. Cam Lindley (UNC, Rising Sophomore, Center Midfielder): The All-American showed his passing range and accuracy all night. He had a couple of hiccups, but his ability to flight a pass over distance showed often. Cam never shied away from the ball, always looking for the outlets to receive it and continue play. Very vocal player, directing his teammates in front of him where to go, and asking for the ball. One of the concerns is whether he can play in the #6 role by himself, his defending left a lot to be desired, possibly putting someone else with him would be the best fit for his continue development. Jeremy Kelly (UNC, Rising Sophomore, Right Forward): The Chapel Hill native has a soft first touch, the control to get out of pressure, and makes good decisions on the ball. He could be more threatening whether it is creating opportunities at goal or going to goal himself, a lot of lateral or backward passes. He doesn’t have the pace of a winger, he looks more of a #10 type. Kelly did come infield and tried to link with teammates through the middle. Even though his role with UNC was limited to being a substitute, he has shown the skill and the ability to adapt to the college game. We will be seeing a lot of him over the next three years. David Lozano (UNC-Wilmington, Rising Junior, Center Midfielder): The big man scored the Hammerheads’ only goal. Very powerful striker of the ball and has a decent skill-set. However his decision-making was poor, he often take too many touches or pick the wrong option rather than making the sure pass. For example, he had Phillip Goodrum open on the left, he used his skill to weave through multiple guys instead and then passed it to Goodrum who at that time was in an offside position. Nothing interesting happened today. Scout’s Notebook will be gone until June 3rd as I will be coaching a tournament this weekend and Memorial Day weekend, I’m heading to a combine. I may or may not write on that. We shall see.